Iconic gay and lesbian songs – our choice! Putting Razzle Dazzle — our summer concert — together was no easy task. This season we decided to celebrate musical icons of the gay and lesbian community. 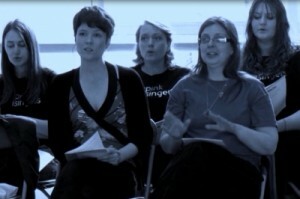 We thought that since we are an LGBT choir it would be easy getting suggestions from the Pinkies. Little did we know that we would be inundated with repertoire ideas, and it surprised even us just how broad the range and quality of music was. The final score of songs, diligently curated, represents to us our choice of the best in iconic music of our community. In the video here, you’ll get to see the Pinkies in rehearsal, and some Pink Singers talking about just a handful of the songs in this season’s repertoire which they put forward or love. Do you agree with our selection? Over on our Facebook wall this week we’ll be revealing some of the other songs from the show. What songs would you suggest? Think about it, post your ideas and don’t forget your tickets to come see the Pinkies take on this theme! Next Next post: Athens Pride – kiss me everywhere!